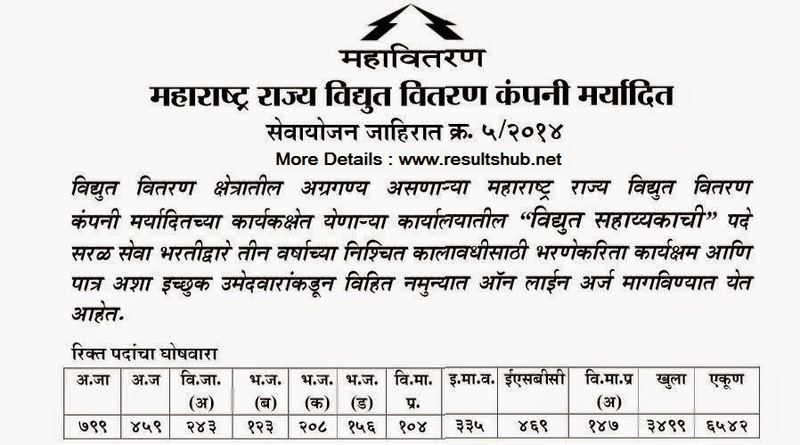 Vidyut Sahayak Bharti 2014 MahaVitaran MSEB Details & Online Recruitment details are given below. Check All details & Important links given below. Apply from the given links. Last date to Apply for Vidyut Sahayak Bharti 2014 is 30 September 2014. All other Details like Exam Date, Exam Pattern, Selection Procedure will be updated time to time on www.resultshub.net, So keep visiting us & mahadiscom.in. Following are the MAHADiscom Vidyut Sahayak Recruitment 2014 details.